Flatbread: Nourish 414 offers Zoo visitors the chance to try two unique pizza flatbreads like the Buffalo Chicken or Brewer, which features bratwurst, caramelized beer-braised onions, cheese and BBQ sauce. Visitors can also stick to the basics with the cheese or pepperoni pizza flatbread options. 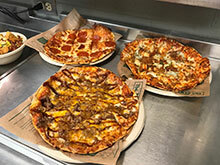 All flatbreads are made-to-order! 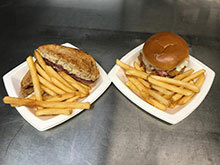 Sandwiches: Visitors have the option between the fan favorite hamburger and cheeseburger or stepping outside the box with the Chicken Cordon Bleu or Midwest “Reuben,” which features toasted Klement’s summer sausage, sauerkraut, horseradish rémoulade and provolone cheese. All sandwiches are served with fries. Salads: Nourish 414’s salads are a great option for any salad lover! 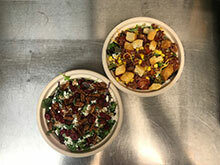 Visitors have the option to choose between two salads. The Kitchen Sink features field greens, cheddar cheese, roasted corn, grape tomatoes, hardwood smoked bacon, garlic croutons and buttermilk ranch. Vegetarian-friendly Grains & Greens features shaved kale, farro, dried cranberries, candied pecans, feta and apple cider vinaigrette. Looking for extra protein? Visitors can add chicken to either salad! Kids’ Meals: Even the pickiest of eaters will find something to eat at Nourish 414! Kids can choose between a PB&J or Turkey Sandwich. Both options are served with Animal Crackers, apple sauce and juice. Drinks: All that food will make a person thirsty. Visitors can choose between soda, water, Gatorade or beer! Nourish 414, formerly known as Lakeview Place, is located across from Lake Evinrude Deck. Step inside to take in the familiar, yet upgraded building featuring modern wood and stone walls. 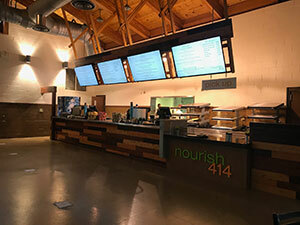 Now open to Zoo visitors, Nourish 414’s menu items are offered at competitive and affordable prices. So, give it a try and you just may find your new favorite food option! Nourish 414 is open year-round depending on weather, with limited hours in winter starting in November.